For people who wish to rank well in Michigan, or any state for that matter, it’s important to understand the search engine optimization of today. The past had to do more with tricks, games and out smarting the search engines. I assure you, today and in the future, you are not going to out smart the search engines. Your best bet is to develop quality educational information and build your brand around your content. If you do this well, the search engines will reward you. You have many options in Michigan. We have excellent SEO companies in the state as well as great SEO information available online. YouTube is another good option to find quality SEO information. If you like videos, definitely check out white board Fridays at Moz.com. An excellent place to start is Google and their guidelines. No mater your source, make sure it is fresh up-to-date information. The following article is full of the latest SEO information. Although, I focus on Michigan in this post, you can certainly use it in your State or town too. SEO stands for search engine optimization. It is a process to earn traffic through organic or natural search results (non-paid) on search engines. All major search engines, such as, Google, Yahoo and Bing have search results, where web pages, information and content such as videos or local listings are shown and ranked based on what the search engine considers most relevant to users. Backlinko.com analyzed 1 million Google search results to answer the question, what factors help rank your website. Below are their findings. 3. 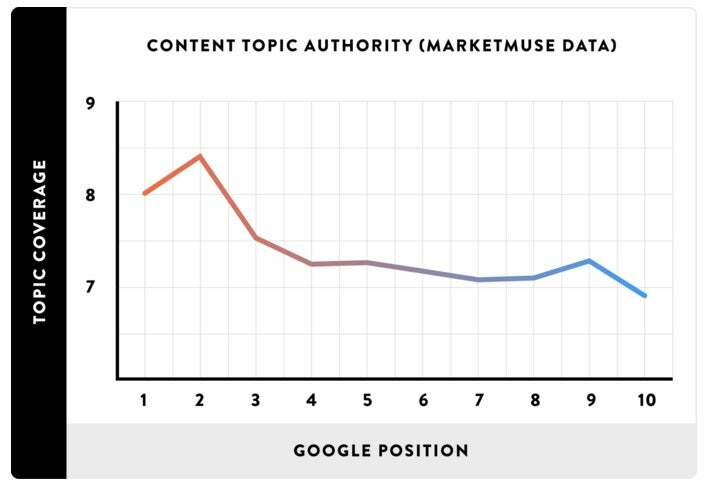 We discovered that content rated as “topically relevant” (via MarketMuse),significantly outperformed content that didn’t cover a topic in-depth. Therefore, publishing focused content that covers a single topic may help with rankings. In the past digital assistants where almost useless gimmicks which failed to recognize your voice accurately and provided less-than-stellar results. Today, more people are relying on voice search, and every major tech company seems to have their own digital assistant capable of awesome feats, including Siri, Alexa, and Google. With the addition of Rank Brain to Google’s algorithm, it is more important than ever to consider the intent of the searcher. Does a person look for Michigan photography want a photograph of Michigan or a photographer in Michigan? There is an important distinction. Savvy Michigan e-commerce marketers are capitalizing on the trend. They offer more search options for local phrasing, slang and more optimization for long-tail phrases and deeper answers that digital assistants can provide directly. Until the last couple years, product pages on e-commerce websites were places for short-form content. For example — a title, brief description, a few photos and customer reviews. However, user demand and search engine changes have shifted toward long-form content in almost every niche. If you want to get ranked for your topic, you must write deep, well thought out descriptions of your products and services. Long form content provides more detail, more long-tail and conversational phrases. These lend to more relevant search queries and more market differentiation from the increased competition. Good search engine optimization leads to more ways to separate yourself from the competition and search combinations which will get your website found online. SEO’s strongly encourage you to develop more long-form content on your company blog, describing your products and offering insights on your company. The hard part is to do this without too much fluff and this takes planning. Think about Michigan locations, related products and hometown services. Maybe your company services Metro Airport? If writing about the Airport and how your company fits into the needs of people traveling to or from the location. Maybe store sells well known Michigan products, write about the products and their history. Overtime, these stories will help establish your strong Michigan connection. Obviously optimizing for your keywords is important. As stated, it’s important to create long-form content. However, there is much more opportunity for optimization. Although aiming for the top positions in Google search for your target keywords is still important, it’s also important to optimize for other Rich Answers too. These are results that appear towards the top organic search results. Meeting Google’s thresholds for mobile optimization is no longer enough to stand out in the search world. Mobile optimization is about offering the best possible content and functionality experience to mobile users, who grow in numbers compared to desktop users by the day. Mobile optimization is beginning to include app optimization, which Google is favors heavily with developments like application streaming and soon, e-commerce platforms may need to develop their own mobile apps just to survive in terms of visibility – according to Search Engine Land. Your website much be easy to use on a mobile device and you may wish to consider your host server speed. Paying a little more for quality hosting may improve your ranking results. Something to consider. Word count is an aspect of the Google Panda algorithm which is often misunderstood by SEOs. Many websites make the mistake that they refuse to publish any content unless it is above a certain word count, with 250 words often recommended. Instead, Google suggests you think about how many words the content needs to be successful for the user. For example, there are many pages out there with very little main content, yet Google thinks the page is quality enough that it has earned the featured snippet for the query. In one case, the main content was a mere 63 words, and many would have been hard-pressed to write about the topic in a non-spammy way that is 350+ words in length. So you only need enough words to answer the query. Meta titles and descriptions are an opportunity for you to tell let the search engines know what your page is about (title tags) and sell your page to the searchers (description tag). Remember to use keywords (but don’t stuff them) with a natural, fluent language. Video sharing capabilities become more advanced and WiFi more available, users are demand more video content. Video content can show up as rich media in search results if it’s hosted on YouTube. In fact, if you are not using video content in your product pages and on your company blog, you’re already behind the times. Video content is only going to become more popular. Event Facebook is suggesting that most, if it’s content, will be video over the next few years. Obviously, being a post aimed a Michigan residents and business owners, we can’t forget the importance of local SEO. This and future years, local SEO will focus more on mobile marketing. The younger your target customer is, the more likely it is that they shop online. However, this doesn’t mean that older customers are not doing the same thing: Note this 2014 study which Google made it widely known that half of the consumers will visit a store the same day they run a local search. Remember, that study was conducted a few years ago. This percentage has almost certainly increased by now. Google knows this because they can track the data from phones. If the searcher looks for a product or service and then goes to the location from the search queries and clicks. You have a match and important data. This is the trend which will continue. Once you identify your website weak points, you may need to get some SEO help to get it in order. After that, get to work on your local SEO campaign. Some business owners like to roll up their sleeves and do SEO on their own, others believe its total nightmare. Whether you do it yourself or hire an SEO expert, there is one thing for certain for 2017 and beyond – you can’t ignore Google nor its impact on local lead generation. Marketers always speculated user engagement is Google ranking factor. The website bounce rate seems to be a measurable factor in search rankings. A low bounce rate means people find a button or link on your website of value and click it. In other words, your website is what they are looking for when searching the Internet. Unfortunately, what makes this factors difficult to measure in search engines is the lack of data supporting it. User engagement is an indirect influence on search rankings. However, it is something which all website owners need to optimize if they are serious about getting more out of their search engine optimization efforts. According to Matt Banner of OnBlastBlog.com. “User engagement is just as important as any other on-site element in this day and age,”… “If a visitor enjoys your website, they’ll stay on your site longer, visit more pages, help contribute to a lower bounce rate for your site overall, and most likely become a returning visitor. To improve your website performance, in the long run, using user engagement as a factor, you may need to use online tracking tools to gain insight on how much interaction your site pages is getting from visitors. Lucky Orange or Google Analytics can help when it comes to user engagement. The idea here is that the more clicks a page accumulates from its links, the more interaction it has with users. Tools like SumoMe Heat Maps and CrazyEgg are excellent ways to break down the number of clicks made by users on your web pages. From this point, you can see which links are clicked the most and least. In other words, what do your visitors like? You can than optimize your website by improving your links and buttons based on the data. To analyze visitor engagement with your site pages, the SumoMe Content Analytics is a helpful tool to look at how many of your website visitors scroll down until the very end of the page. From this data, you may also find which part of your page where 50% of your visitors leave. This can also be accomplished using Lucky Orange. Determine which elements of your site pages serve as obstacles which prevent visitors from scrolling down your page and optimize your site as needed. Google has multiple names to parts of their algorithm. He influences the rank of your website different. Google Panda is notes the of quality of your content and Penguin focuses on the quality of links pointing toward your website, and Hummingbird handles conversational search queries. There are more and the keyword for all algorithms is quality. The search engines want their customers to have a great experience with search results. The following is more detail on the various algorithms. Please note, in this section, I rely heavily on key resources listed at the end of the article. Google Panda is about the quality of a website as it relates to content. The algorithm take into account numerous signal when rank websites in the search results. For websites which have lower quality content, they will likely find the site negatively impacted by Panda. As a result, this causes higher quality content to surface higher in the search result rankings. This means higher quality content is often rewarded with higher rankings, while low-quality is sent to the bottom of the list. When Panda first launched, many professionals saw it as a way for Google to target content farms, which became a major problem in the search results with their low-quality content and information that tended to rank due to high volume. These sites published a large amount of low-quality content on topics with little research, and it was very obvious to most searchers who unfortunately landed on one of the pages. Panda as evolved in to the core Google algorithm. Previously, we had a known Panda update date, making it easier to identify when a site is hit or recovered from Panda. Now, it is part of a continuous slow rolling update, lasting months per cycle. As a result, it’s hard to know whether a site is negatively impacted by Panda or not, other than doing a content audit. An SEO must identify the key factors which websites hit by Panda generally have on their pages and posts. It’s important to understand that Panda does not target user-generated content specifically. Such as guest posts and comments. This is something many website owners are surprised to learn. Although, Panda can target user-generated content, it tends to impact those sites which produce a lot of low-quality content – such as spam filled sites with guest posts. Please, do not remove your user-generated content, whether it is generated in forums, blog comments or article contributions, simply because you heard it is negative for your website. Look at it from a quality perspective. There are many highly ranking sites with user-generated content, and many websites would lose a lot of traffic and rankings simply because they removed that type of content. Even comments made on a blog post can cause it to rank. Make sure your content matches the query. This is important. If you see websites sending traffic to your page for specific queries, be sure your page is answers the question searchers are looking for when they land on the page. If it is not, add an extra paragraph or two to ensure that the question is answered, so your page continues to be relevant to the search engine. If you are struggle to determine whether a piece of content is considered quality or not, there is one good way to confirm. Look in Search Analytics or your site’s analytics program such as Google Analytics and review the individual page. If Google is sending it traffic, then clearly the search engine is viewing your pages as quality enough to rank well in the search results. However, if a page does not receive traffic from the search engines, it does not automatically mean it is poor quality, however, the content may need a closer look. Is it newer material and not received enough ranking signals to rank yet? Are there areas of improvement you can make by adding a paragraph or two, maybe change the title to match the content better? There is nothing wrong with trying to improve both new and old content to make the quality of all your pages better. Lastly, do not forget there is traffic available outside of Google. You may question a page because Google is not sending it traffic, however, it may do amazingly well in Bing, Baidu, or one of the other search engines. Diversity in traffic is always a positive thing, and if you have pages which Google might not be traffic to, but is gets traffic from other search engines or other websites or through social media shares, then removing such content is a bad move. How to prevent Google Panda from negatively impacting your website really simple. Create high-quality, unique content which answers the question searchers are asking. A good tip is to read your content out loud to tell if the information is high-quality or not. When text is read aloud, things like over usage of repetitive keywords, grammatical errors, and other signals that the content is less than quality will stand out. Read it out yourself and edit as you go, or ask someone else to read it so you can flag what should be changed. A good tool to consider to help your writing is the Hemingway app. Technical SEO also does not play any role in Panda. Panda looks just at the content, not things like whether you are using H1 tags or how quickly your page loads for users. That said, technical SEO can be a very important part of SEO and ranking in general, so it should not be ignored. But it does not have any direct impact on Panda specifically. The second major Google algorithm is Penguin. Penguin focuses on link quality and nothing else. Websites which have purchased links or acquired low-quality links through places such spammy directories, low-quality blogs, link badges and infographics. Should You Worry About Penquin? Most websites do not need to worry about Penguin unless they have done some sketchy or black hat link building in the past. Maybe they hired a SEO who might have engaged in those tricky tactics. Even if the site owner does not know what a SEO is doing, the website owner is still responsible for the links. This is why website owners should always research an SEO before hiring. If you have had link building performed in the past, while such tactics were no harmful, and now against Google’s webmaster guidelines, you could be penalized by Penguin. For example, guest blogging was fine years ago, but is not a great way to build links now unless you are choosing your websites well. Likewise, asking site visitors or members to post badges which linked to your website worked in the past. However, they will now result in Penguin or a link manual action. Penguin focuses on a website’s incoming links. Google only looks at the links pointing to a website in question and does not look at the outgoing links at all from that site. It is important to note there is also a Google manual action related directly to a site’s outgoing links (which is different from the regular linking manual action), so the web pages and sites you link to could result in a manual action and the deindexing of a site until those links are cleaned up. If you suspect your website is negatively impacted by Penguin, you need to do a link audit and remove or disavow the low quality or spammy links. Google Search Console (also known the past as webmaster tools). includes a list of backlinks for website owners. However, be aware that it also includes links which are nofollowed. If the link is nofollowed, it will not have an impact on your website. However, keep in mind, the website could remove that nofollow in the future without warning. When assessing a website’s links, do not assume that because a link comes from an .edu or .org site that it is high-quality. There are plenty of students who sell links from their personal websites on those .edu domains which are very spammy and should be disavowed. Likewise, there are plenty of hacked websites within such domains that have poor-quality links. Do not make judgments strictly based on the type of domain. You can’t make automatic judgements about domains based on the TLDs (Top Level Domains)and ccTLDs. Google does confirm that just being on a specific TLD it does not help or hurt the search rankings. So, a .com is not necessarily better than a .xyz, However, you must make individual assessments. Is Penguin Bad For Small Businesses? If you read some forum discussions, the Penguin Update has ruined Google’s search results. Make no mistake, it’s easy to find plenty of strange happenings in Google’s results. There is no mass outcry from ordinary Google searchers expressing Google results suddenly got worse. There’s also little outcry from publishers who have been harmed by updates and certainly not from publishers who have gained. Those who’ve gained have no reason to say anything. After any update, it’s always possible to come away with a skewed view that the sky is falling. After other updates, Google was accused of trying to put small businesses out-of-business and get more AdWords cash out of big brands. If SEO is dead, it sure has been taking its time dying. The fact is SEO is dead when Google stops ranking search queries from 1-10. If Google really does have a master plan to wipe out small businesses, it has worked over the last ten years. The reality is the vast majority of small businesses are getting a lot of traffic from Google, real small businesses which make real things or provide genuine services. However, if the definition of a small business is a person who writes hundreds of articles for a blog, to carry Google’s or someone else’s ads alongside, then spins the articles using software into slightly different versions multiple blogs so they can carry more ads, then yes, those types of businesses are in danger. None of this takes away from anyone with a quality website who has been harmed by Google updates. If Google’s screwing up on listing relevant websites; want that corrected. Search engines didn’t suddenly stop sending everyone traffic. Google didn’t just stop sending sites tons of traffic. A bunch of websites definitely get hit, some of whom probably should be hit. On the other side many websites are rewarded, some of whom should be rewarded. Most people probably noticed little or no change at all. Here’s hoping the people who are hit mistakenly, or who weren’t rewarded as they should have been, get corrected quickly. Do not look at the list of links and automatically consider links from specific websites as being a great quality link, unless you know that very specific link is high quality. Just because you have a link from a major website such as CNN or your favorite blog does not make that an automatic high-quality link in the eyes of Google. Many high-quality websites sell links, in some cases disguised as an advertisement. It some cases, a or contributor may sell links within their posted articles. These types of links from high-quality sites actually being low-quality has been confirmed by many SEOs who have received link manual actions which include links from these sites in Google’s examples. As advertorial content increases online, we will see more links like these become flagged as low-quality. Always investigate links, especially if you are considering not removing any of them based on the website the link source. Once you review your backlinks in Search Console and determine there are some links which should be removed or disavowed, you will need to get these links removed. First, you should approach the website owners and request them to remove the links pointing to your website. If the removals requests are unsuccessful, then add those URLs to a disavow file — which you will submit to Google. There are tools that automate the link removal requests and agencies will handle such requests as well, but do not feel it is necessary to do this. Many website owners find contact forms or emails and do it on there own. Some website owners will demand a fee to remove a link from a site, but Google recommends not paying for link removals. All you need to do is include them in your disavow file. Some website owners use link removals to generate revenue, so the practice is becoming more common. The next step in cleaning up your Penguin problem is to submit a disavow file to Google. The disavow file is a file you upload to Google which tells the search engine to ignore all the links included in the file so that they will not have impact on your site ranking. Make sure only links you believe hurt your website are submitted, because the removal of quality links can hurt your website rank too. This is a good reason why it is so crucial to check your backlinks well before deciding to remove them. If you do find the disavow link removals hurt your website there is a solution. If you have previously submitted a disavow file to Google, you can replace the file with a new one — Google will not add to add to the old file. So, it is important to make sure that if you have previously disavowed links, you still include those links in your new disavow file. You can always download a copy of the current disavow file in Google Search Console. When you recover from Penguin, do not expect your rankings to return to where they were to be before the Penguin hit. Many site owners are under the impression that they will immediately begin ranking at the top for their top search queries once Penguin is lifted. This is not the case. It takes time. First, some of the links that you disavowed were likely contributing to an artificial high-ranking, so you can’t expect such rankings to be as high as they were before you took action. Secondly, because many site owners have trouble accessing the quality of their website links, some high-quality links may inevitably get disavowed in the process. There is a negative SEO aspect to linking. Some website owners worry that a competitor could buy spammy links and point them to their site. And many use negative SEO as an excuse when their site gets hit by Google for low-quality links. If you are worried about this, you can proactively disavow the links as you notice them. However, Google has said they are pretty good about recognizing this happens, so it is not something most website owners need to be concerned about. The latest version of Penguin has one notable change. Instead of site owners needing to wait for an update or refresh, the new Penguin is now in real-time. This is a huge change for those dealing with the impact of spam links and the weights many have had to endure after cleaning up. Google’s algorithm Hummingbird is part of the main Google search algorithm and was the first major change to their algorithm since the early 2000’s. The difference about Hummingbird is that this one is not specifically a spam targeting algorithm. Rather, it is an algorithm to ensure they are serving the best results for specific search queries. Hummingbird is more about being able to understand search queries better, particularly with the rise of conversational search — people talking to their phones. SEO’s believe Hummingbird is positively impacting the types of sites which are providing high-quality content that reads well to the web searcher and is provides answers to the question the searcher is asking, whether implied or not. Hummingbird impacts long-tailed search queries, similarly to how Rank Brain is helping these types of search queries. Google wants to make sure they provide high-quality search results for longer queries. For example, instead of sending a specific question related to a company to the company’s homepage, Google will serve an internal webpage on the site about that specific topic, questions or issue instead. This is a good reason why focusing on answering customer questions is so helpful to your Michigan focused SEO. You can not optimize for Hummingbird. Optimizing for conversational search is not easy. These are longer search queries, such as, what we see when people talk to their phones. The types of queries that searchers tend to do on mobile devices are often considered conversational search. To optimize for conversational search make sure your content is highly readable and answers longer tail queries. Like Rank Brain, Hummingbird was released for a period before it was announced, and SEOs did not particularly notice anything different regarding the rankings. It is not known how often Hummingbird is updated or changed by Google. As stated, SEO is dead when people stop using search engines and the search engines discontinue ranking search results from 1 to 10. As you may realize now, after reading so much about SEO. Many of the SEO tricks are dead. Below is an adopted list of 10 SEO myths you may hear on the street. This is certainly the most popular SEO myth. It is widely spread among sites and communities and people who wish to sell you something in place of search engine optimization. Many SEO’s promise to rank your business at the #1 spot for little money. However, even if they manage to deliver their promises, SEO is not just about the ranking, especially when focusing on the goal of reaching the top spot. SEO is about increasing search traffic, engagement and eventually conversions (sales) and this cannot be done by merely focusing on the site’s position in SERPs. It’s true that being on the first page of a search engine can lead to an increase of traffic to your page, yet the goal is not to simply gain the #1 spot. For example, featured snippets, the summary of an answer to a user’s query that is displayed on top of Google search results, can lead to an increase of traffic of up to 20-30%, however 70% of them do not come from the first organic search result. Thus, it’s the optimization of the content, the usefulness and the relevance of the information that leads to additional traffic and make your rank position more effective. There was a time when keyword density was synonymous with good SEO practices, however, as search engines keep adjusting, so does SEO strategy. Keywords are still part of your optimization, yet the focus is more on the content and its relevance, rather than the exact keyword. The arrival of RankBrain has made even clearer the focus on relevance, with your web pages being crawled for its content and the user experience, rather than the exact keyword. No more awkward headlines using the keyword more than once, let’s concentrate on the content and the intent of the searcher. Quantity must not be placed over quality, especially when it’s simply picked as your SEO strategy. You can create as many webpages as you want. Each page is an opportunity to be found. And focusing on multiple Michigan topics is helpful, as long as the quality is high. So, if you feel that the pages add value to your site, consider adding a new page. You can always add to an existing page on the same topic. Not every page gets indexed and quality is a crucial factor for your attempt to increase your site’s results. Make sure every page has a purpose. If you beleive that SEO is not working for — know more about SEO. If you have a website, than SEO is important. SEO is not a one time event which solves all your problems; bringing your website to the top of the search engines. SEO is a continuous process which needs to be re-evaluated and monitored to ensure success. As websites and search engines change, so do their optimization for improved visibility, so if you feel that SEO doesn’t work for you, then maybe it’s time to start all over again with one step at a time, until you understand enough the process. Don’t underestimate the value of mobile optimization. It’s important to note Google officially measures the mobile-friendliness of your site among its ranking factors. Mobile optimization is all about the user experience, whether it’s the design of the webpage, the responsiveness site design, the number of clicks, the page load speed, or even the screen size. We cannot underestimate Accelerated Mobile Pages (AMP), Google’s attempt to improve the performance of mobile web articles with a fast version of a page. As it now arrives in organic search results, it’s becoming quite imperative to give it a try and enhance the user experience and hence, the traffic to your post. Link building or as I like to refer to it as Link Development has been proclaimed dead multiple times, yet it’s still around and important. Link building is about creating or earning links with the ultimate goal to increase a site’s presence to increase traffic. It may not be efficient anymore to be part of a private blog network or use spammy anchor text, however the fundamental goal of link building is still present and part of Google’s algorithm, provided that we know how to use it. A link building strategy is time consuming, however it can be rewarding. Don’t the fact that links are still important ranking factors. According to the moz “The State of Link Building Survey”, the most effective method of link building in is based on content, whether it’s promotion, or guest posting. What’s promising is the fact that the state of link building is still strong as good links matter. Many assume that social media has nothing to do with SEO, because your social traffic is not a ranking factor for search engines, Yet this doesn’t mean that social does not influence your online presence. Social media usage keeps increasing, your authority is gradually building among many different platforms and this can help search engines with discovery and indexation. Content distribution has moved towards social media, which means that social sharing can contribute to effective link building and of course, increased traffic to your website. Social media marketing can help you increase your site’s visibility which is also appreciated by search engines. Think of how Google+ can be spotted by Google, or how the indexed tweets might increase your brand awareness, credibility and authority. Although there is no guarantee that a successful social presence will boost your SEO, there is an indication that it can help. Search engines can not read the thousand words your photographs represent. You need to provide the right description to make them visible. Google suggests you use descriptive titles and captions, while the use of a keyword can also be useful. As visual content continues to become more important; image optimization becomes more valuable to your traffic generation. It’s an easy process, we sometimes need to remind ourselves to do it when creating new content. If you use WordPress click on the edit icon on the image and add relevant information. Every year Local SEO is becomes more important. However, not everyone understands how it can be useful even in the least expected case. You don’t have to own a local business (or brick and mortar store) to benefit from local SEO. If you feel that your business is struggling to benefit from local SEO, then maybe it’s time to start with a few basic steps, in order to help its local visibility. How is your customer service? This can play a role. Do you provide the correct information online? Are you focusing on mobile customers? Note: 94% of mobile searches are have a local intent). It’s true that the quality of your content is important, however if you don’t optimize or promote it, how will you reach a greater audience? SEO is about helping search engines discover your good content, this means that you are increasing the chances of being praised for the work and ranked as an expert or relevant answer. Content is king, yet it’s not always enough to provide the necessary traffic and visibility. If you are creating top-notch and your information is amazing, and you don’t publish regularly, you many not get the search traffic you are looking for from your blog or website. Search engines like Google want to give searchers the very best results for their search queries. To show search engines your blog is a good resource for relevant queries, it’s helpful to publish high-quality fresh content regularly. Once a week is usually a good place to start. However, more is better. Don’t always publish the same type and length of content. It gets boring fast for both readers and search engines. When you vary the types and lengths of your content, not only are readers are more engaged, but search engines love your site and send you more traffic. This is because the mix of lengths and media creates a better user experience and is more likely to be useful to searchers. However, as mentioned above, longer post over a couple thousand words tend to rank better. Always include at least 1 image with every blog post, and use more if you can. Infographics, videos, and slides are excellent visual supplements to your regular written posts. It has been shown that the more images you place in your post the more sharable it becomes. For text posts, 500 words should be the minimum if you are concerned about SEO. That length gives search engines enough text to crawl and plenty of keywords and signals to help them understand what the article is about. Most blog posts are not over 1000 words. So, if you want to rank well, you need to consider what your competition is doing and improve upon the quality and length. Google will rank shorter post, however, those tend to come from higher authority blogs. As mentioned in other parts of the article, Longer keyword phrases might not get high search traffic like shorter keywords, however they’re almost always more relevant to the searcher. It’s much easier to rank well for longer keyword phrases. Often people using longer phrases are more serious prospects. Linking to authoritative, trustworthy websites such as Wikipedia, and known thought leaders in your field, locations in Michigan or any domains ending in .edu or .gov can create a better an improved experience. It also shows the search engines you truly want to help searchers. They may reward you with higher rankings and more traffic. Use internal links to your other blog posts while writing is am excellent copywriting tip which helps to benefit both readers and search engines: It helps readers find what they’re looking for, helps your audience get to know, like, and trust you, helps search engines crawl every page on your site, helps search engines create an accurate sitemap. Speaking of sitemap, make sure you add a site map through Google Search Console. Link to your internal pages for the some SEO benefit. It’s like linking to other blog posts, with the added benefit of generating leads and sales. Since that’s what you want for your business blog. Search engines depend more on social signals to deliver high-quality results to their customers. Plus, visitors want to see social proof to determine if your blog is worth their time. This means you absolutely must share your blog posts on social media. Just as important, make it easy for visitors to share. Encourage sharing by placing large social buttons in prominent places and using calls to action inviting them to share. If you don’t ask, people may not share as much. Most blog platforms allow you to show newer, older, and similar articles at the bottom of each blog post, improving navigation for readers and crawling for search engines. Navigation and usability are important to search engines because they help visitors find what they’re looking for and create a better user experience, while a better crawling experience helps search engines understand your blog and website better. Every article you publish should have at least one good and relevant image. This makes it more appealing and easier to share through visual social media like Pinterest. When you Create your own original images it’s possible earn more traffic through image search and build awareness of your brand as it’s shared on visual social media sites. To many people, SEO is full of misinformation and conflicting advice. Believe this editor. I’ve been there. When I Google “SEO”, I am quickly overwhelmed with a mountain of anecdotes, case studies and best practices. I may pick up a few tips, but for the most part, I can be tough to make heads or tails of the information. Fortunately, someone else recently took the time to make sense of the topsy-turvy SEO landscape. Brian Dean and a team of data partners at Backlinko recently analyzed 1 million Google results to see which ranking factors are important for SEO in 2016. Of the 20-ish ranking factors reviewed during this study — backlinks are still the no one important rank signal that Google uses. However, not just any backlinks. This study found that you need backlinks from many different domains, not just different pages. So, if you get 100 backlinks from the same domain, it’s not going to catapult you to the top of Google. However, if you earn 100 links from one hundred different domains, you will see a difference. The best links you can get are contextual mentions from authoritative websites, including high-value blogs and media websites. This study also found that bounces aren’t just bad for your bottom line: they can hurt your SEO efforts. Using data from SimilarWeb, the study found that websites with a high bounce rate tended to rank lower in Google than sites with a low bounce rate. The following data suggests bounce rates may cause lower rankings. If visitors regularly bounce off of your website regularly, it sends a clear message to Google that people don’t find your information valuable. It makes sense that Google may demote websites with a lot of bounces. However, the study mentions in the report that a low bounce rate may be a byproduct of great content. In other words, if you write a great article, people are going to hang around longer. How do you decrease your website bounce rate? The answer is make sure your great content is above the fold. The headline is strong and the first few sentences draw people in to your information. If you can hook them quickly, they’re significantly more likely to look at other pages. Another way you can improve bounce rate is to break your writing into small chunks. Walls of text can scare a fresh viewer to your site. However, when you break your content into shorter sentence paragraphs, it becomes much easier to digest. 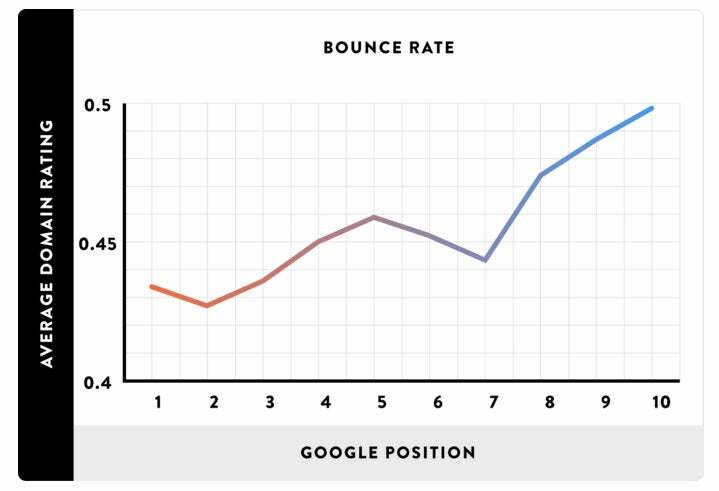 The more of this study, spend some time to improve your bounce rate. It definitely doesn’t hurt your SEO. You often hear that people online have short attention spans. 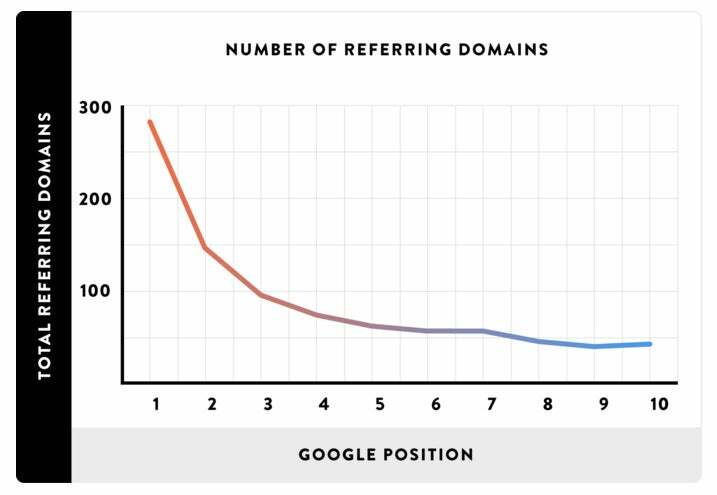 Still, as mentioned in previous sections, long form is more authoritive, which Google likes and longer content is share more people by people looking for good information. Consider if you found a 3,000 word article on a topic which interests you deeply, would you skim it? Of course not! You’d read every word. 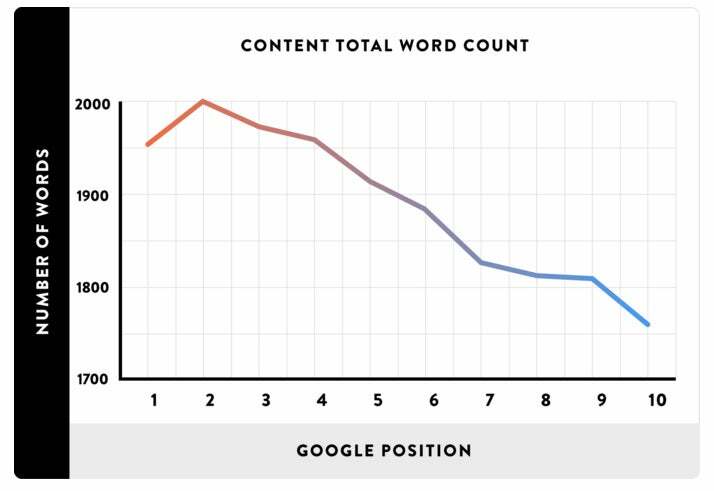 And the study shows that not only do people like reading long-form content, but it tends to rank better in Google. According to the data, the average first page results in Google boasts 1,890 words. That’s a lot more than your average 400-word blog post. Too many SEO’s believe if they write 400-500 words that is fine. However, at that level you find your article sitting in the middle of all the Internet noise. Compelling writing with long-form content give you have a one-two punch that’s very powerful. This means you must have a good handle on the language you are writing and write well. 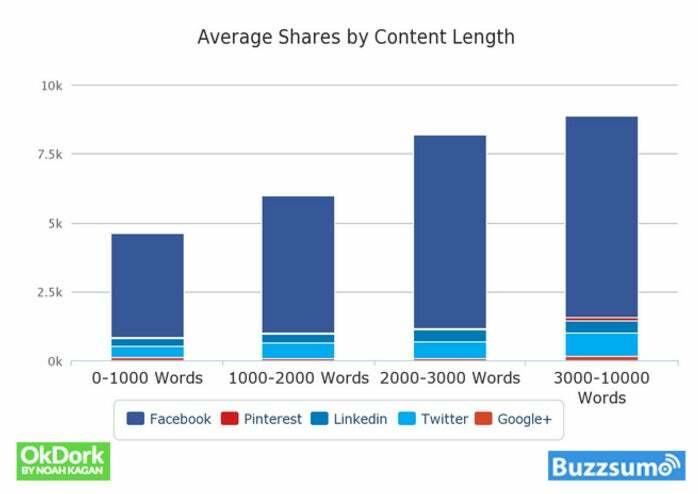 As mentioned above, this study shows longer content tends to be shared more on social media. (BuzzSumo). When you look at the content that brought in the most shares and receives the most Google traffic, they tend to be more than 2,000 words. This article is over 10,000 words. Yes, there is a lot of original writing, however, we depend on the good work of others too. If you do also use work from other blogs and articles, make sure you give credit and links. We don’t recommend you copy articles. Google will penalize your pages. However, if you use word for word to share information on your blog, ask permission from the original creator. An article full of fluff does not light the world on fire. The following study found the same thing. They discovered that content rated by software as topically relevant ranks above content with a low content score. This means that when you write about something, cover one topic in-depth. For example, this post is about search engine optimization. Although, you can apply the information in many ways, we’ve focused on Michigan residence. We want to specifically focus on getting this information to people in our community. In our experience, focused long form content produces better results. And, in some cases, may boost your search engine rankings. 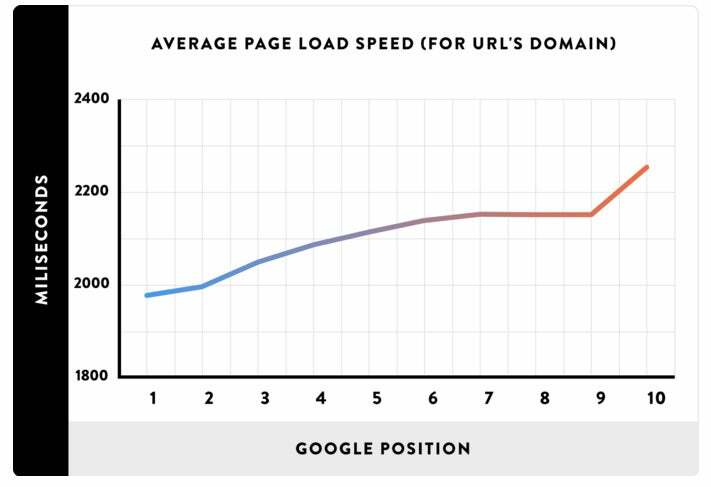 You most likely know that Google prefers fast-loading websites. In fact, Google has emphasized that they use site speed as part of their algorithm. Why?, because a fast loading website offers a better user experience. Google wants excellent results for their customers. RankBrain and artificial intelligence will continue to become a more important part of search. People will continue to talk to their phones or the computer hanging or in the walls of their home. The search engines don’t want any part of their algorithm gamed. New technology will continue to play a roll in search. The search engines will continue to improve visual search and well as understanding the intend of the searcher. As mentioned in the article, many will claim SEO is dead. However, as long as Google continues to rank its results from 1 – 10, there is always a reason why one website ranks above the other. The job of the SEO is to figure out why. When it comes to the businesses in Michigan or businesses who depend on Michigan people. Take the time to think about what the people of the state want and create incredible information and educational materials which they will enjoy reading and want to share.